On May 10th to 15th, 2013, the Rinzai Zen Sangha hosted its Inaugural Sesshin, dedicated to the memory of Nyogen Senzaki Zenji, with Eido Shimano Roshi, as its invited guest teacher. We inspired the cool, crisp, lilac and magnolia scented spring air at a beautiful, secluded, historic country mansion. It reminded me of the somewhat informal and improvisational sesshins, at the Daibosatsu Zendo Guest House, before the construction of the monastery. Of all the sesshins that I have participated in, during the forty-three years that I have been Eido Roshi’s student, this sesshin was, undoubtedly the most memorable. We were only twelve students under Eido Roshi’s watchful eye. It was everyone’s first time, in over two and one half years, to be in sesshin with Eido Roshi. It was also my first time to lead the zendo as its Jikijitsu. With Yusen Junko Fujii as our Tenzo and Zensho Martin Hara as Assistant Tenzo, each day we were all treated to the most elegant and sumptuous vegetarian meals, all with a Japanese flair. This Sesshin took more than one year of single-handed preparation and organization, with meticulous attention to the details, by Ekyo, Urszula Sapeta. During the Sesshin, as Shikaryo / Jisharyo / Fusuryo, she coordinated and facilitated the tasks of all the Sesshin Officers. They were as follows: Jokei,Yushin Tim Hale; Inji, Riki Kixmiller; Ino, Kogen Carlos Cervantes. Each day, Zenrin Robert Lewis and Karuna Washburn, recited the Diamond Sutra in English. Ecko Noelle Carruggi, was the Hatha Yoga Instructor. Eido Roshi gave 100% of himself, especially evident, during teisho and dokusan. 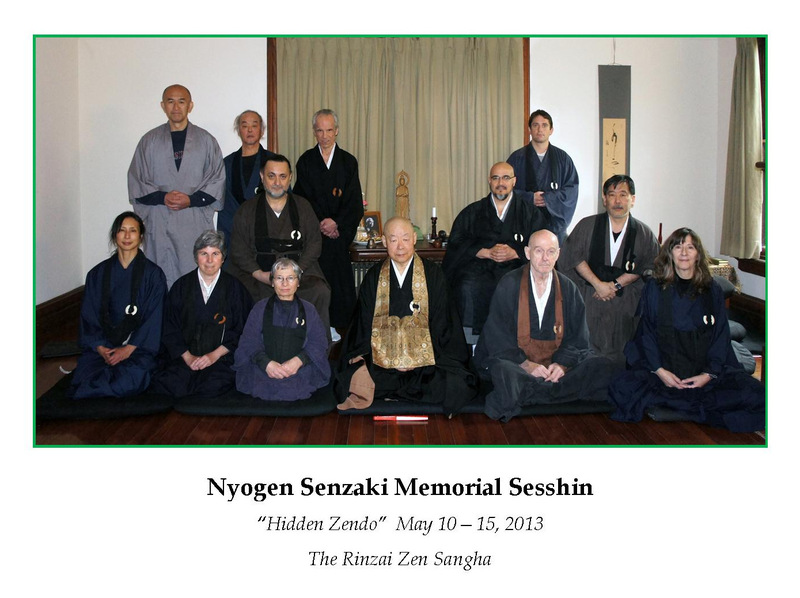 The subject matter for Teisho was from the Rinzai Roku, spiced with comments and stories from the life of Nyogen Senzaki, the corner stone of our American / Japanese Zen Mandala. Dokusan was given three times per day. Since we were only 12 of us, Eido Roshi made a commitment to interview all students that came, during each dokusan session. That was three personal teaching sessions each day, with Eido Roshi! This was the most auspicious opportunity to receive, from a Japanese trained Master of Zen Masters, personalized coaching and encouragement beyond the usual horizons of our regular training and practice. Throughout this sesshin, an image kept appearing, in my mind’s eye. This was triggered by a remark made during Teisho. Eido Roshi said that, “Taizan Maezumi Roshi would often goad him with the fact that, Eido Roshi built Zen edifices, whereas Maezumi Roshi trained people.” It reminded me of an old conversation that I had with Eido Roshi, before he became my teacher. After serving, a most distinguished career as the founder / builder and Abbot of the Zen Studies Society, Eido Roshi was now ready to realize his spiritual dream of offering a “sumptuous French dinner” to the Sangha during this extraordinary inaugural session. I assert that this vision will continue to be realized through his future encounters with the Rinzai Zen Sangha.